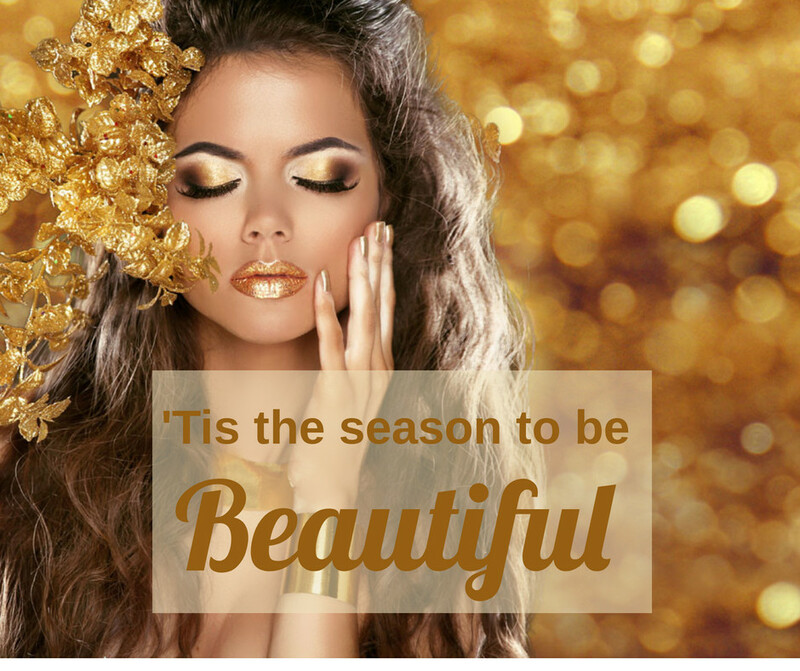 Make time before the holidays to give yourself the gift of LOOKING AND FEELING BEAUTIFUL! Open house holiday event with special one day only blow out pricing up to 40% off! Take advantage of the lowest prices of the year! It will be a fun event with hors d’oeuvres, some bubbly, a grand prize raffle basket, and much, much more! We promise you, you won’t want to miss it so be sure to mark your calendar. Come learn about our latest laser technology to improve your skin featuring our new state of the art lasers for skin rejuvenation and pigmentation. 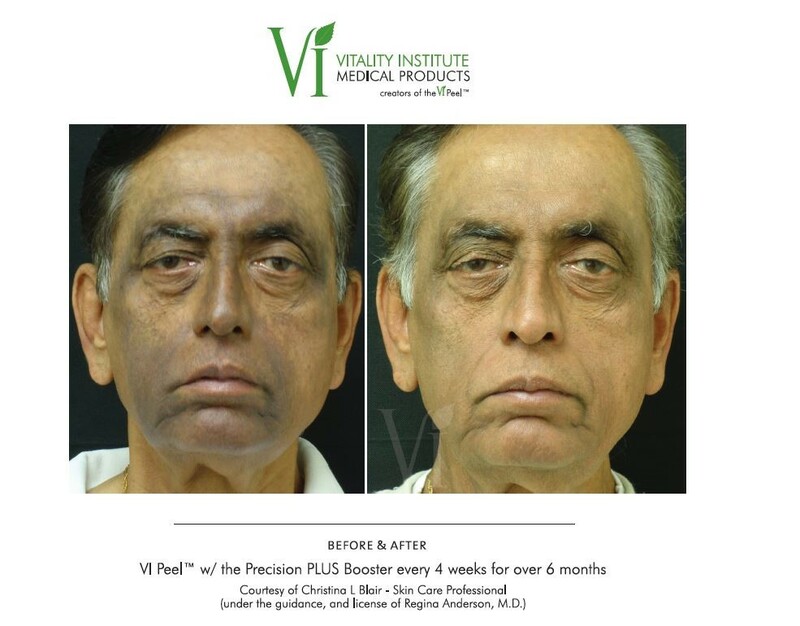 This new technology that can benefit you and make you look younger and feel more youthful. PiQo4 Laser is ideal for Melasma and is the most advanced laser for tattoo removal using picosecond technology. M22 IPL is ideal for removing sun spots or sun damage on hands, face or other body parts. 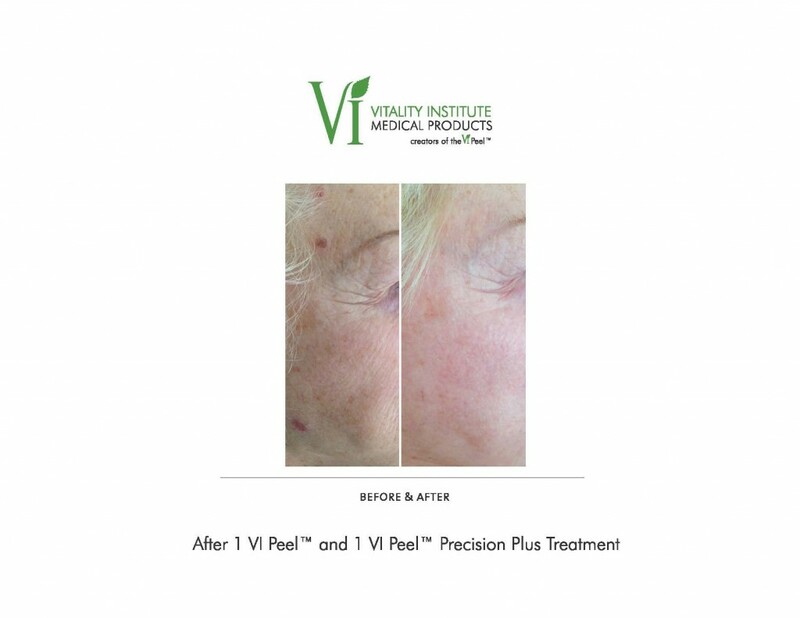 Our new vascular filter is ideal for removing blood vessels or telengectasias of the face or the redness of rosacea. 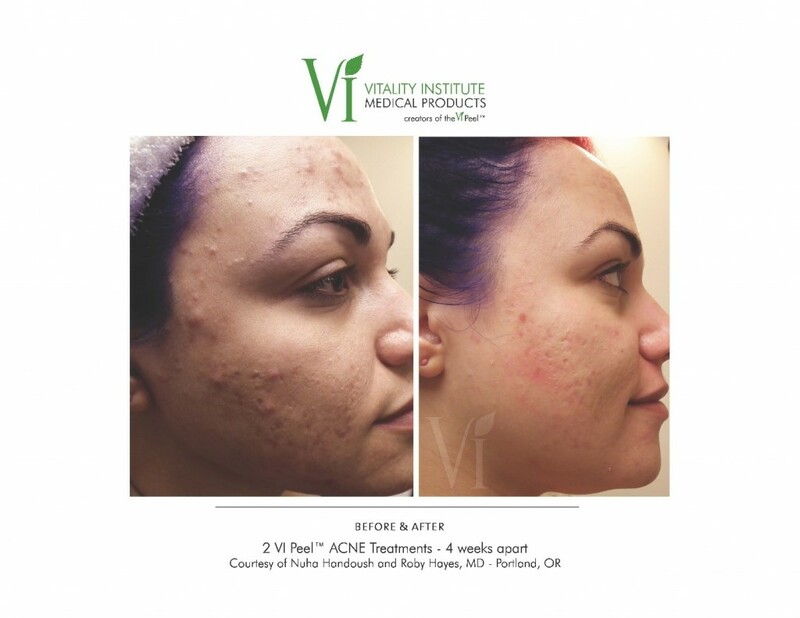 Many patients love the photofacials for pore size reduction. Light Sheer Desire is our new high speed laser hair removal device. It does not require messy gel and provides more comfort and better hair reduction than other technologies. Resurfx laser is ideal to help stimulate collagen remodeling with the advantage of no downtime. Active/Deep Fx for skin rejuvenation is our gold standard laser to turn back the hands of time 10-15 years with maximum wrinkle reduction and skin tightening in one procedure. To make sure you don’t miss out, make sure to register for this event here. 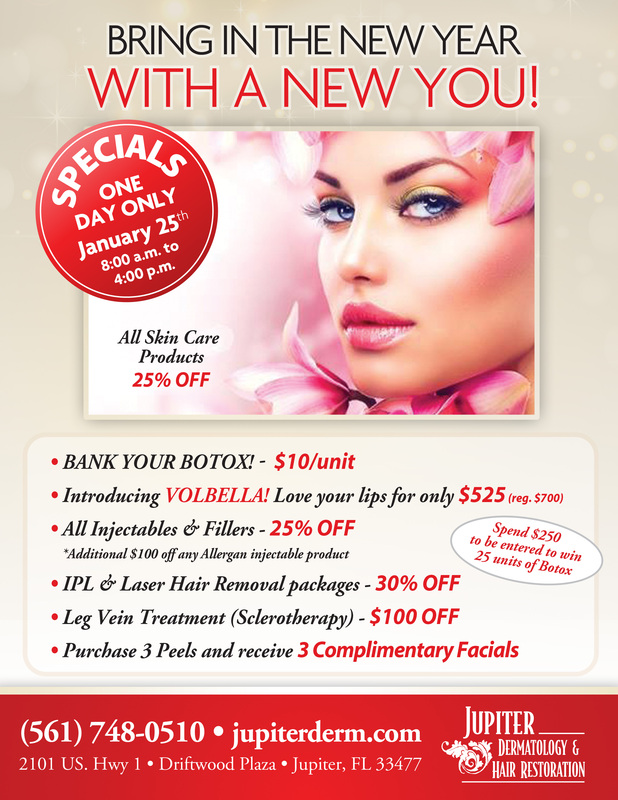 Fillers- 25% off any 1 vial or buy 1 vial, get 2nd vial 50% off. If you purchase $500 or more on any laser package, you will receive 1 free area of Botox. 40% off any area: Full arm, half arm, back, Brazilian and standard bikini, chest, chin, full face, full leg, half leg,lip, sideburns half leg, men beard, underarms. 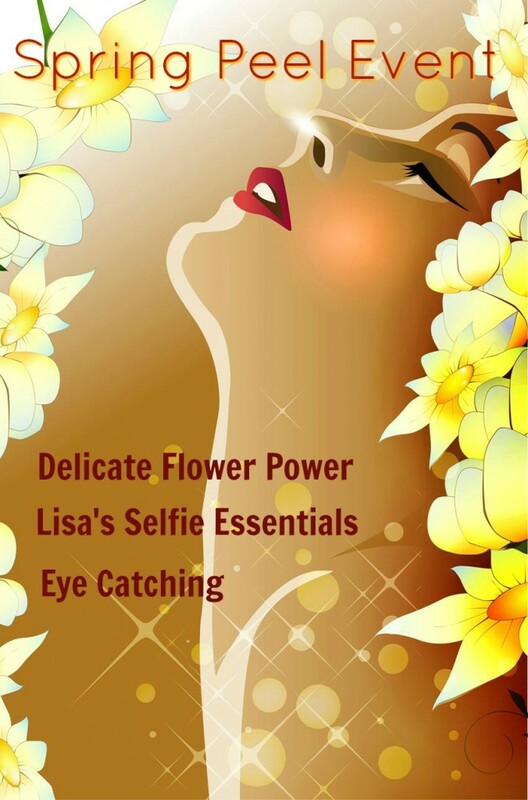 To learn more about Light Sheer Desire read here. Prices vary depending on the size of the tattoo you want removed. For this event, 40% off any tattoo. More information on the PIQ04 for tattoo or pigmentation removal. 1 treatment or any package of 3 or 6. Body treatments: Full face, neck, chest, full arm, half harm, hands, legs. More information on IPL Photofacial. Microneedling Only: 30% off! One day special pricing: 1 treatment for $195. Package of 3 for $540. Package of 6 for $975. More information on microneedling here. Save $100 on two treatments of Eskata. One day special price, only $400. Buy 1 get 1 free. 1 treatment for $300. Package of 3 for $800. 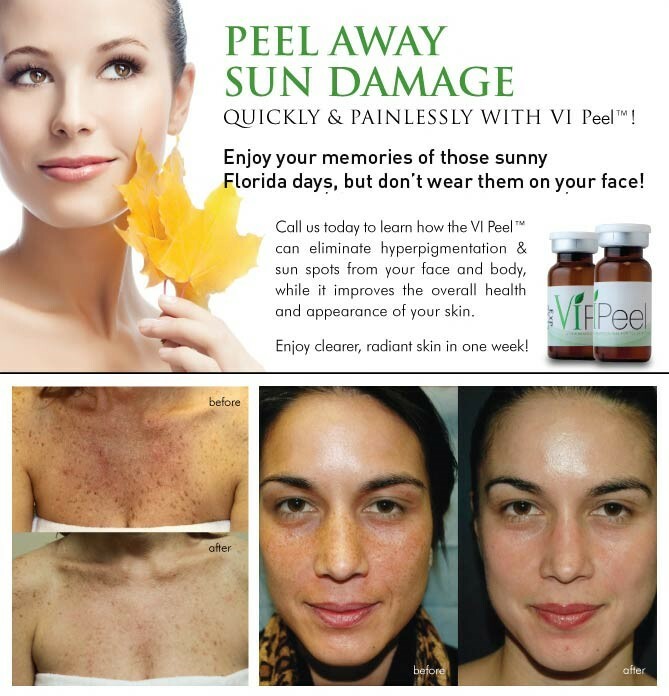 Buy any 3 peels and get 3 complimentary facials. All Skinceuticals and Skin Medica products 30% off. Ready for a fun night? Make sure to register here. If you are on Facebook, share with your friends and family or simply share this link! 20% Off ALL Colorescience Makeup! And that’s just for starters. Get the looks with longer lashes for luscious eyes, smoothed over fine-lines, lip filler with free Colorescience shine and double-chin meltaway with Kybella. 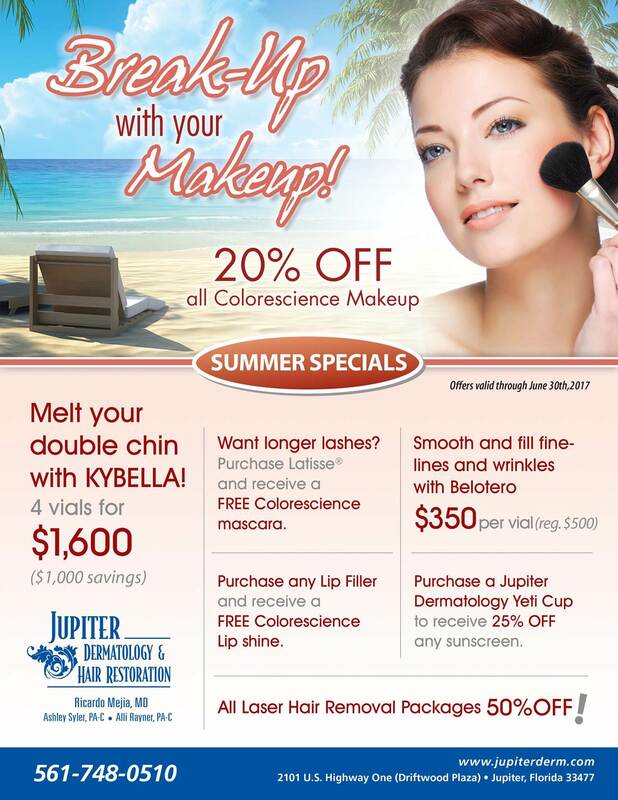 Jupiter Dermatology has you covered for all your Summer 2017 beauty needs. Summer is here and we are giving away free makeup. 4 vials of Kybella for not $2,600, not $2,000, not $1,700 but for only $1,600! That’s right! $1,600 for 4 vials of Kybella double-chin meltaway magic! We must be crazy! See flier for details. 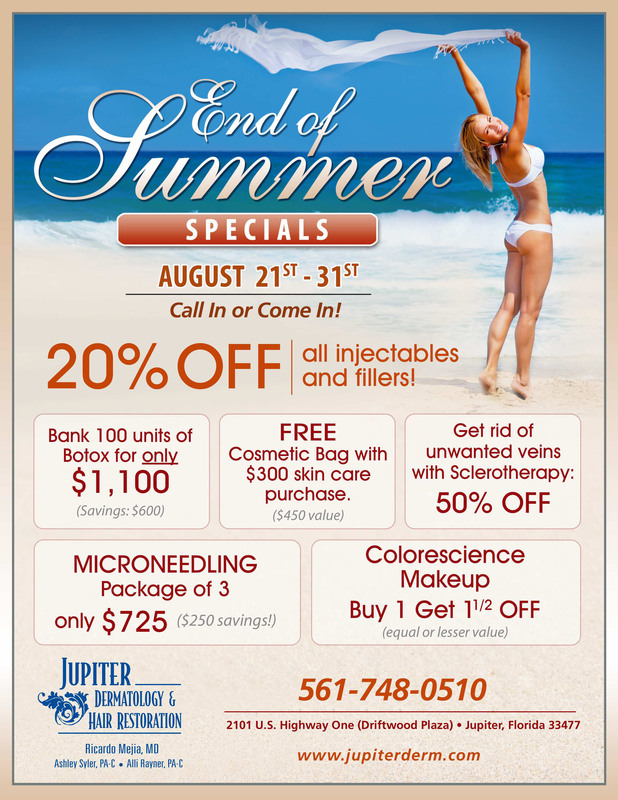 Come to Jupiter, Florida to get these cosmetic deals from Jupiter Dermatology. 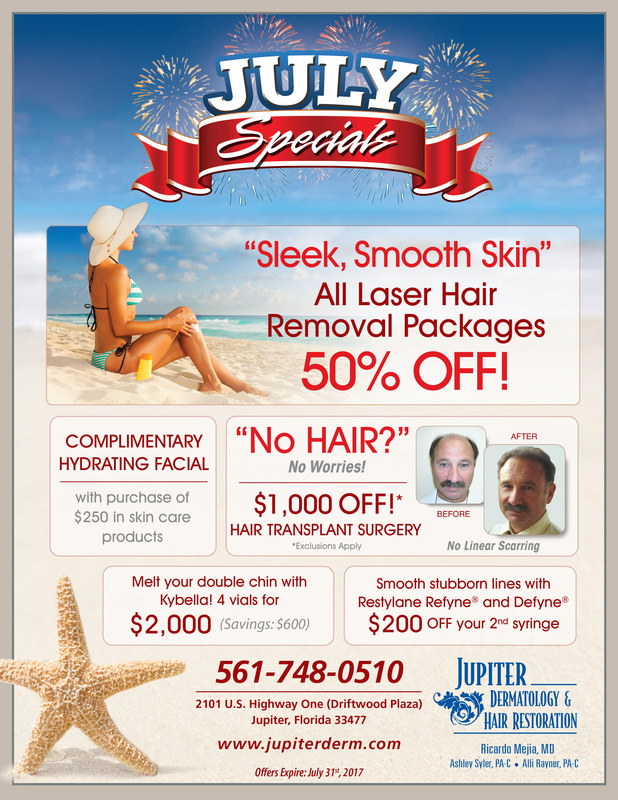 These summer specials offers include 50% off all laser hair removal packages. 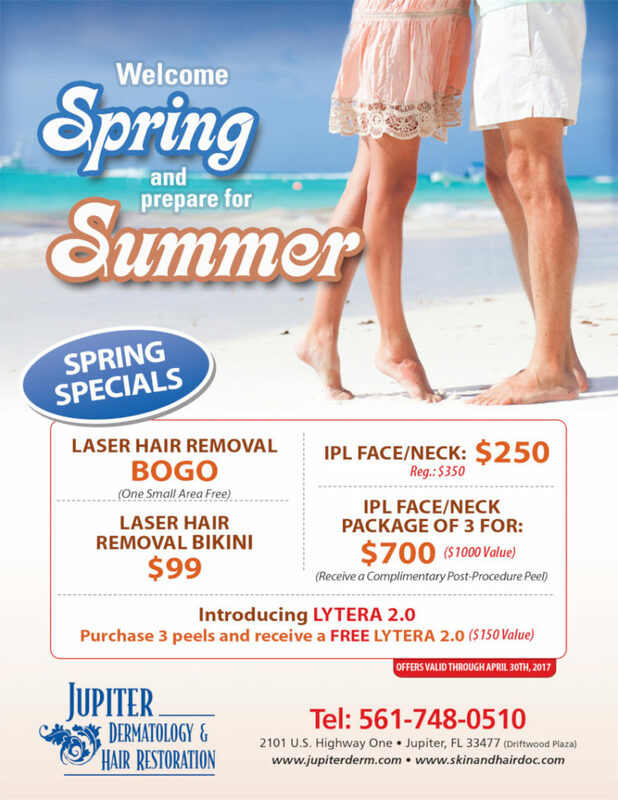 Spring is here and Jupiter Dermatology is ready to help you enjoy the season with new special deals on laser hair removal and IPL skin rejuvenation treatments. Get an IPL Neck/Face treatment for $300 $250. Get a 3-pack IPL Neck/Face treatment package for $1000 $700. Laser energy is a highly effective, targeted and proven way to remove hair. This spring 2017 you can buy one, get one free laser hair removal and we are offering bikini hair removal for $99. Book a consultation or call 561-748-0510 to speak with one of our patient care co-ordinators fast because these offers end April 3oth 2017. Bring in the New Year with a new you! New Year event for one day only. Celebrate 2017 with our special deals on botox, fillers, hair removals, vein treatments and peels. All happening Wednesday, January 25th, 2017. Come between 8am and 4pm. Remember to ask about ‘Volbella’! Join us as we celebrate our Grand Re-Opening! Our construction is done with our new office and it’s time to say thank you with unbelievable discounts, prizes, and giveaways! Call us now at (561) 748-0510 to reserve your spot and your personalized beauty package! 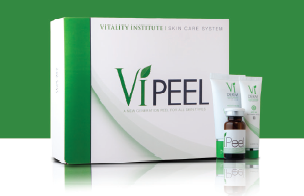 Spring Peel Deal Event – April 1st – No Joke! No joke, these specials are the real deal! Total Value: $1,585 – Savings of 40%!! Total Value: $1,035 – Savings of 35%! Total Value – $885 – Savings of 40%! Reserve your spot today! Either call Senta at the office at 561-748-0510 or fill out this form and let Senta know what package you are interested in and she will reserve your spot. 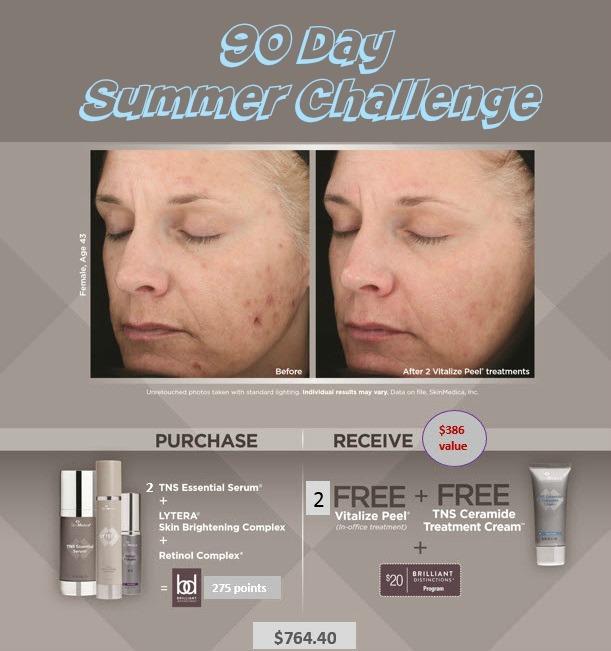 Are you up for the 90 day challenge for beautiful skin? Save your skin this summer with SkinMedica. In 90 days rebuild collagen, reduce deep and fine lines, reverse sun damage and brighten skin. 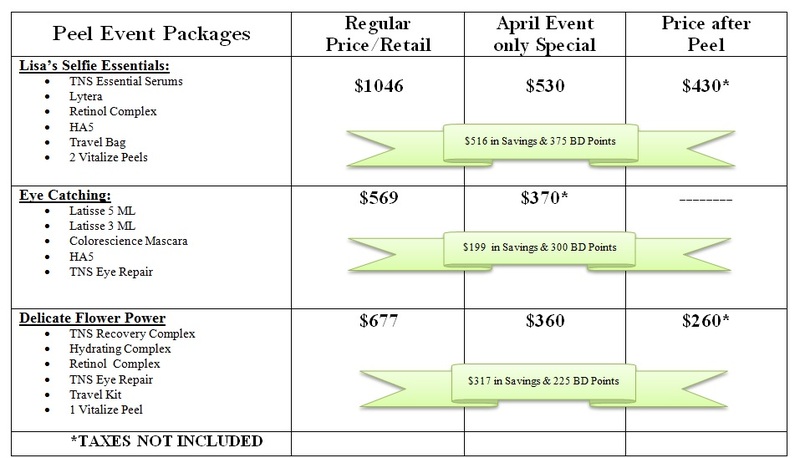 For this challenge, we are offering a fantastic package deal that saves you $386. 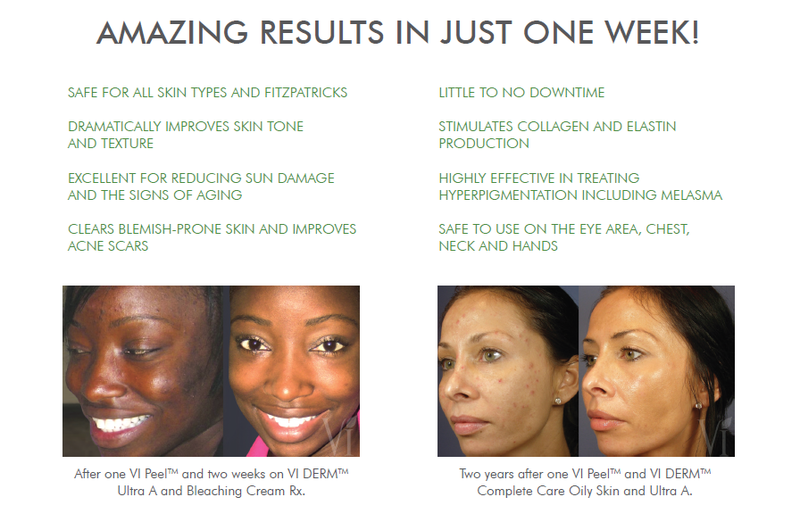 Buy the 3 products above for $764.40 and receive 2 free Vitalize Peels and a TNS Ceramide treatment cream. I wonder if Dr. Mejia can tell those of use entering the “aging mode” how to do it so that we can remian looking natural and not just fixing the immediate signs of aging, but also working to repair and delay it.